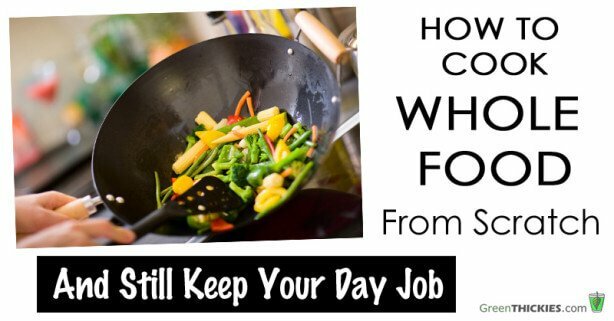 How to Cook Whole Food From Scratch - and Keep Your Day Job! 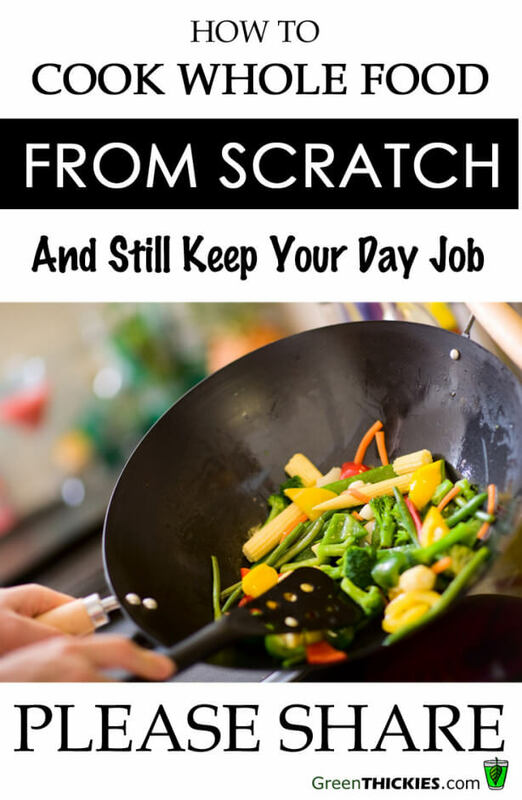 How to Cook Whole Food From Scratch – and Keep Your Day Job! Whole fresh foods should be the basis of what we all eat, whether your nutritional type is protein type, carb type or mixed type. Whole foods, whether meat, vegetable or fruit, do two things: they provide all the nutrients that nature put into the food–not just as a sum of nutrients, but even more, as a synergy of nutrients that work together because they naturally interact within the living plant or animal. When we eat these foods, which have been connected with our whole existence as a species, the total health benefit to us is much greater than the sum of the parts. The second practical advantage of eating whole fresh foods is that they substitute, by their sheer bulk, the chemicals and denatured food derivatives that we might otherwise eat. Here’s a big key, says Dr. Proefrock, to getting out of that trap. Plan on the weekend what you will eat for every meal the coming week. Your menu does not have to be set in stone; you can leave room to juggle for spontaneity now and then, but at least provide for enough of your own homemade food to eat each time you get hungry.So how do you make your own homemade whole food and keep your day job too? Clear enough freezer space–about one cubic foot–to store several pint and quart-size containers of the food you will cook. Then on the weekend, plan all of your meals for the week, and go to the supermarket once to purchase the whole food ingredients in one trip. Consolidating all grocery shopping into one trip already saves time over shopping for a few items everyday. Plus, with whole foods, you only need to go around the periphery of the supermarket where they are located, rather than taking time to go up and down the interior aisles where the processed foods are. Once you’ve brought home all the groceries, cook all your meals for the week at the same time. This way, instead of standing at the stovetop each day for each meal, you are there for one longer session during that week, and then you’re done! The trick is to cook big portions, but freeze in the smaller quantities that you and your family will eat throughout the week. If you cook for a family, a large recipe will probably be good for two dinners (on alternate days) during the week, as well as a lunch or two. If you live alone, you will get at least four meal portions with half of them saved for the following week. At this point you don’t have to spend any more time throughout the week than you would on TV dinners. A food processor will work well for foods that you want to chop finely. Make freezer bags full of pre-cut vegetables that you can then defrost as needed during the week. One bag might contain pressed garlic with coarsely chopped string beans, which a few days from now you can sauté in coconut oil for a few minutes. Another bag might contain chopped carrots, onions and tomatoes, along with cabbage that you cut into quarters. Sprinkle some caraway seeds into the bag. When you’re ready to make a meal of it, you can cook it a portion of it in a cup of chicken broth for a delicious meal of balanced nutrients. Make use of large cooking vessels in order to accomplish the weekend cooking fiesta. A large crockpot really lends itself well to a whole foods diet. Here you don’t need a food processor. Chop vegetables very coarsely, in much larger chunks than you can get away with in a stovetop meal. This step alone saves a lot of time. Put an organic beef round or two turkey legs or a whole organic chicken on top of the vegetables, add a few cups of water, and/or tomato sauce, perhaps with balsamic vinegar. Sesame oil and tamari may be used instead for marinade. Add whole leaf herbs as you like, and you’re done. After practicing once or twice, you will have a huge crockpot meal thrown together in five to 10 minutes. Set it on “low” in the morning, and you’re done till dinnertime. In cool weather, you could do the same in the regular oven, with a Dutch oven type covered pot in fewer hours. Now it’s a Tuesday morning, and you’ll need something for dinner. Defrost one of the meals you prepared on the weekend. In the evening when you’re ready to cook it, place it into a serving dish in a toaster oven rather than a microwave. Toaster ovens have several advantages over microwaves. At about $40 they are much cheaper, smaller, and quieter. However, those benefits are far outweighed by the health advantage: microwave rays are unhealthy radiation, and when you microwave in a plastic container, it drives the phthalates from the plastic right into your food, which gives an otherwise excellent meal a toxic twist that you definitely do not need. Microwave radiation also leaks throughout the whole kitchen from most microwave ovens, which creates an unhealthy atmosphere for adults, children and pets. For re-heating in your toaster oven, you’ll need one or two Pyrex-type serving dishes, about a liter each. Heating leftovers for two or three people in a toaster oven takes 10 to 15 minutes, not very much longer than a microwave. Use your toaster oven to prepare hot, healthy lunches for yourself and your family. Invest in a good-sized thermos with either glass or stainless steel (not aluminum) interior for each family member. While eating breakfast, heat up leftovers from last night, or a separately defrosted meal in your serving dish in the toaster oven, again for 10 to 15 minutes. Spoon it into each thermos. Then in each lunchbox, add a fork and little containers of nuts or some fresh fruit or some celery, cherry tomatoes, cucumber or carrot sticks. You all will then have lunches that will be wonderfully nutritious, well balanced, and appetizing for every adult and child in your family. When all lunches are prepared together assembly-line style, the process will go faster than if each lunch is made separately. And your savings will begin to be obvious as your restaurant and fast food expenses plummet toward zero. Take advantage of savings on seasonal produce. Get organic whenever possible. It has been by steadily rising consumer demand that growers have begun to get more and more organic produce into your local stores.Here is a way to extend the seasonal savings. Fruit preserves can be made unsweetened, and rely only on the natural sweetness of the fruit. Buy a case of about four pounds of berries when in season. Also buy three Granny Smith apples for pectin, which is a natural jelling agent. Peel and core the apples. Cut into about 1/2-inch cubes. Place the apple pieces in a large pot, with about three pounds of washed and stemmed (if necessary) berries. (Keep the other one pound fresh for snacking.) Simmer the berries and apples on low for about an hour while you are preparing your week’s worth of meals. At the end of an hour, you should have a thin fruit spread. Take a potato masher and mash any remaining chunks of apple and berries as desired. Let it cool. The texture will get a little thicker. Freeze it in pint-size containers. This makes a nice fruit spread that will keep indefinitely. You may be surprised that the berry flavor is plenty sweet enough without added sweetener. You can spread this with a nut butter on slices of apple or pear for breakfast or snacks. Don’t forget condiments. How often have you bought a bunch of parsley or cilantro with the good intention of using all of it, only to find most of it forgotten and wilted two weeks later, shoved behind other foods? When it’s still fresh, chop it up finely and store in Ziploc-type bags in the freezer. Then you can access it as needed for the one teaspoonful you may want, without having it wilt away before you get a chance to use it. But if you really want fresh herbs, grow them. My favorite Greek salad dressing calls for mint, oregano and parsley, which fortunately are all easy to grow, so I make sure I always have at least one plant of each growing, and I harvest sprigs each time I make the dressing. The fragrance alone of the just-picked herbs is what makes the salad. For the crockpot, food processor, thermoses and toaster oven recommended above you may spend about $130. In order to recoup that investment, do yourself a huge favor and change your mindset about potable liquids. There is really no good reason to drink anything other than water (R.O filtered or spring water). In fact, when we drink other liquids, we train ourselves to slake our thirst with different tastes than water, which then makes the taste of water seem strange. Since our bodies are 90 percent water, the only thing strange about this is our acquired perception of water as strange. Leave the heavy and expensive juices, teas, lattes and liquor at the store. Water is the only substance that can quench both the thirst we feel and the dehydration that almost everyone experiences to one degree or another. Drink it as you like it, with ice or without, with lemon or without, but reacquaint yourself with the one beverage that hydrates and moisturizes all the way in to the cellular level and out to the skin: water. Colleen Huber writes about naturopathic medicine for her monthly newsletter at www.naturopathyworks.com. I completely agree with Colleen Huber that planning your meals at the beginning of your week and spending some time doing food preparation will help you stick to a healthful diet. I also recommend keeping an assortment of your favorite fresh raw veggies in therefrigerator, and raw nuts, for snacking, since the more raw foods you can incorporate into your diet, the higher your nutrient intake. I personally aim to consume about 80 percent of my diet raw. By the way, it’s a myth that eating healthful, natural foods is prohibitively expensive. In fact, consuming a fresh, organic diet doesn’t have to cost much more than a diet filled with processed foods and junk foods.For tips on which foods you don’t need to buy organic and which ones are worth the extra cost, please follow the link to my previous article. It’s everything your body doesn’t need. It’s time to realize that we’ve shifted too far from what we evolved to eat, and there are no magic pills that can save us from the ramifications of that. We must also realize that we will not be able to move forward unless we return to a diet of locally grown, fresh, whole, natural foods. Foods that meet these standards will almost always be a wise choice. Click here to find a list of sustainable agriculture movements in your area, from farmer’s markets to food coops and more.